I hope you all had a wonderful weekend. Mine has been really nice and it was such a welcome relief after our crazy week with the termites. Luckily it seems we caught the problem early enough but of course the adventure didn’t stop there. Mid week when the temperature was getting pretty hot here we turned on the AC and only hot air was blowing. Oh my goodness! Luckily it was just a wire that needed to be fixed and it was still under warranty but still. Just having to deal with that is no fun. What was a ton of fun though was going to my paper marbling class on Saturday. This was a class through the Austin Book Arts Center (fabulous place). I had done paper marbling quite a few years ago and while some of the stuff I remembered, I feel like I got a lot more information in this class and I was totally into it. I did better marbling smaller pieces as it’s just easier to handle but I was happy with some of my larger pieces too. The largest being approximately 9 x 14 inches. I tried some metallic inks, marbling on cloth and marbling on different types of pieces of paper. I have to say I really liked the results on the small piece of muslin cloth. We learned to make a stone pattern, which is the most basic, a gel-git, a peacock and a nonpareil. We had plenty of time to play and I actually enjoyed pulling a second piece of paper after the initial piece. Normally, paper marbling is like a monoprint – one time print, but going through a second time was fun too as you could pick up a softer image. It wouldn’t be nearly the same but you could definitely find some surprises. I’m not sure what I’ll do with all of my pieces yet but there are two that I could definitely see as book covers and many others for my art journaling. I apologize for being absent from blogland but hopefully I’ll be getting back in the swing of things soon. What did you do this weekend? 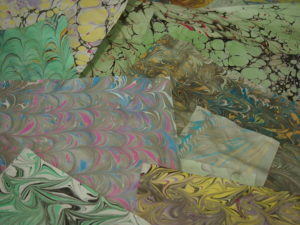 I love marbled paper–such beautiful designs and colors! 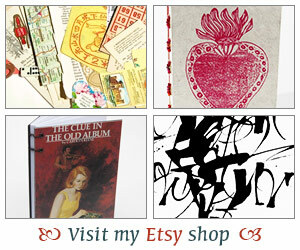 Your papers are delicious, and I’m sure you will find them useful in your books and art journals! I love your paper! How fun! Hope nothing more bad happens for a while to give you a chance to recover from the termites! So pretty! Love the colors especially the green one and the yellow on in the front of the photo. Glad the termite adventure is over and you got them early! I love the look of marbled paper. It’s so beautiful. I am sorry you had to deal with more household trouble after the termites (but am so glad you caught those little guys early!). Bee-yoo-tee-full! What a joy to be able to create such things. The weekend here was cluttered and task-filled, but this weekend will be rather different and I’m looking forwad to that!